That’s a poor attitude to healthy living, isn't it. 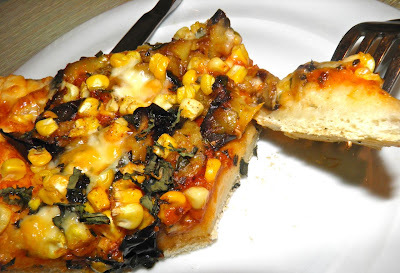 Here’s a deliciously different pizza that will make vegetarian converts out of all your friends. 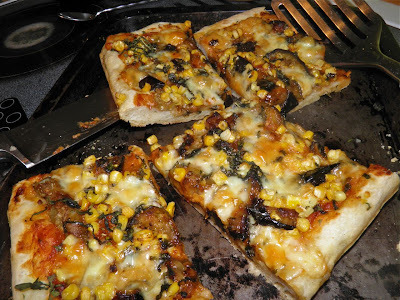 Smoky eggplant combined with sweet fresh corn and lots of garlic. Three things inspired this recipe. The first was that I had an eggplant and a couple fresh ears of corn in my refrigerator. Necessity is always the mother of invention. The second was, believe it or not, a salad recipe I found. The ingredients were grilled eggplant, corn and cubed bread. The recipe had two of my bases covered, as well as opening up the possibility of doing something else I wanted to try. to be 2 medium ears. 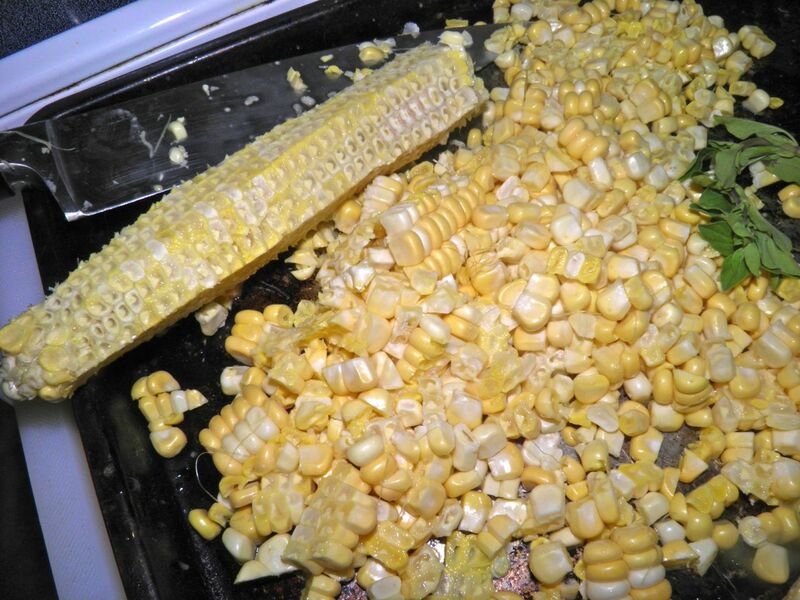 I didn't use quite all the kernels. If you’ve never eaten it, eggplant is a common “substitution” for meat in recipes from around the globe. The taste of the vegetable when grilled, broiled or pan fried is very deep and complex. It may be an acquired taste for some, but a good choice to add to your diet. One drawback is that many recipes call for salting sliced eggplant to draw out some of the “bitter” liquid. I’ve abandoned that practice altogether. I really don’t find it makes that much of a difference. If you don’t salt the slices, here’s the nutritional "skinny.” Eggplant is very low in saturated fat and cholesterol. It is also a good source of Vitamin K, Thiamin, Vitamin B6, Folate, Potassium and Manganese, and a very good source of dietary fibre. If you salt the slices it (of course) is high in sodium, and a majority of the calories do come from sugars present in the vegetable. But all in all, it’s an excellent addition to your meals. Here’s one interesting fact. Eggplant contains the most nicotine of any vegetable. But don’t worry. You would have to consume 20 lbs of eggplant to get the same amount of nicotine that’s in one normal cigarette. So much using it in a stop-smoking plan!! 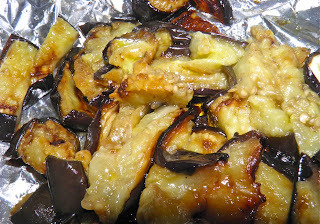 I find eggplant particularly delicious served with fresh herbs, cheese, garlic and tomato sauce. An excellent way is in eggplant parmigiana (here), moussaka (which I have to make and post) or…. pizza! Give this one a try. It won’t disappoint. There’s tasks to do while the dough is rising, so read therough the entire recipe before you start. This is the dough after the first 2 hour rise. Very puffy. Get out your KitchenAid mixer. Combine all the ingredients together with the hook attachment in the KitchenAid bowl. 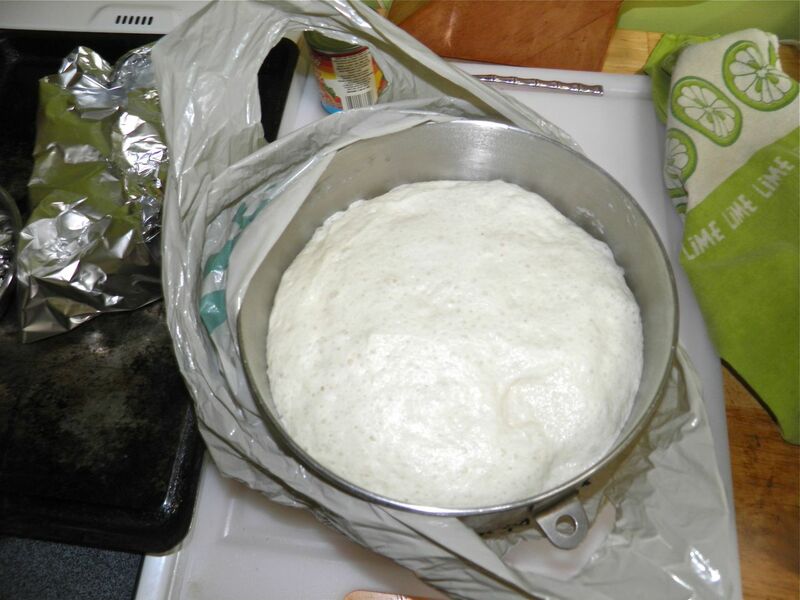 Let the dough rest for 10 minutes, then knead on medium speed for 15 minutes. It will become very smooth and elsatic and quite sticky.That’s OK.
Cover the dough with plastic wrap and a tea towel. Let rise for about 2 hours in a warm place. In summer the best place is outside. Press out into the pan and let rise for an additional 45 minutes before adding any ingredients. While the dough is rising slice the eggplant into 1/2” thick slices. Brush with olive oil, season with a little salt, and broil until browned on both sides. Let cool and then cube. Roast two whole heads of garlic in the oven. Slice off the tops to expose the cloves, pour a little olive oil on top, wrap and tin foil and bake for 1 hour at 400°F. Let cool so they can be handled easily and then remove from their paper. Remove the kernels from two fresh ears of corn. Run a kitchen knife down over the ears to cut them off. This is best to do on a plate or cookie sheet. It can get a bit messy. To make the pizza sauce, combine the tomato sauce, the cloves of garlic, some salt and pepper and the cayenne in a small blender. Blend together until the garlic cloves are completely broken down. This is the garlic tomato sauce. Preheat the oven to 425°F. Once the dough has risen, dimple it down well with your fingers. Spread the sauce over the dough. Arrange the eggplant pieces on the pizza, followed by the raw corn kernels. 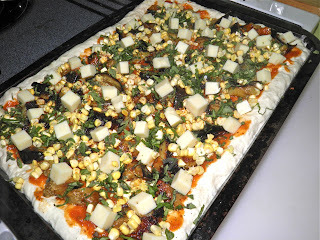 Then add the herbs and stud with the mozzarella cubes. Bake for 25-30 minutes. Let cool slightly and serve! 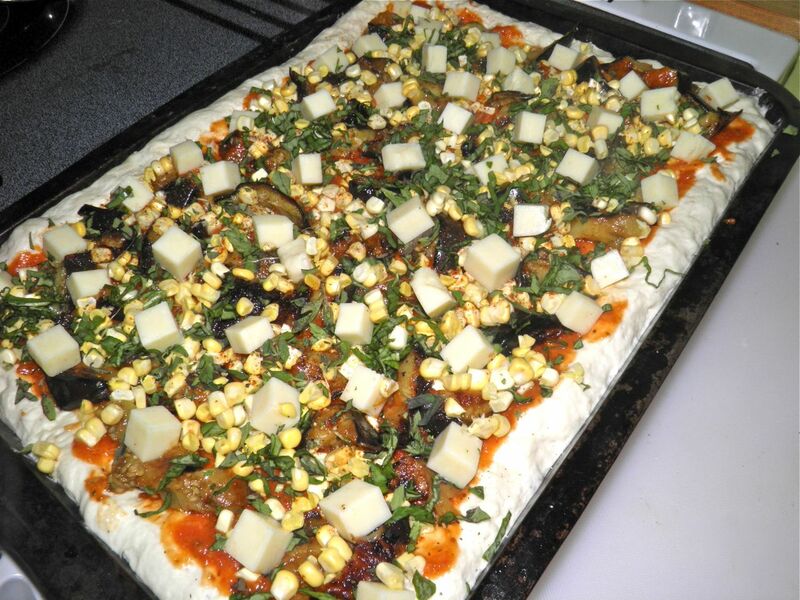 This recipe made a 12" x 16" pizza, certainly enough to feed 4.